Born in 1925, Ronald Ryan grew up in boys' homes after being neglected by alcoholic parents and caught for minor theft. He slipped into petty crime and in 1964 was sentenced to 13 years' jail at Melbourne's Pentridge Prison for a series of robberies. In Pentridge, he befriended inmate Peter Walker, and together they trained for an escape the following year. On 19 December 1965, during the prison warders' Christmas party, they scaled the prison's inner wall and reached the guard's walk, surprising warden Helmut Lange. Ryan saw a rifle on the wall of the post and grabbed it. They had not intended to use firearms but Ryan realised that if he didn't use it, Lange would. Another warden, George Hodson, came out from the party and went after the escapees, without sounding the alarm. When Ryan heard Walker call for help because Hodson had caught up to him, Ryan turned and a shot rang out. Hodson died almost instantly. The two men completed their escape and were on the run for 19 days, during which time they also robbed a bank. But after a nation-wide manhunt, Ryan and Walker were re-captured in Sydney, extradited to Melbourne and tried for murder. During the trial it was revealed that another prison guard had fired at the escapees, and all parties agreed only one shot was heard. Ryan himself maintained that he had not fired the gun, but despite ambiguous evidence and the fact that Ryan's rifle was never examined to determine if it had been discharged, the jury found Ryan guilty of murder. He was given the death sentence which was not commuted to life, although this had been the practice for the past 35 death penalty cases since 1951. Sydney Morning Herald, 2 February 1966. Before 1900, up to 80 people were hanged in Australia every year. But between 1901 and Ryan's hanging in 1967, only 114 people were legally executed in Australia. However, the Victorian premier, Henry Bolte, was determined that Ryan be executed, and would not be deterred by strong opposition from the general public, the media, and prominent politicians and clergy. 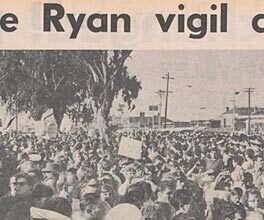 Ryan was hanged on February 3 1967, closing the door on Australia's history of capital punishment.